Recently, I delivered a main stage keynote presentation at Influence 2018, the National Speakers Association annual conference. In my talk with 1,500 in the audience, I shared how professionals can use newsjacking to get noticed, to generate media attention, to book speaking gigs, and to grow business. With thanks to NSA, I’m thrilled to share the full video of my 20-minute talk. As professionals, we're recognized experts. When there is news in your marketplace, reporters and analysts are looking for experts like you to comment on the story. Newsjacking - the art and science of injecting your ideas into a breaking news story to generate tons of media coverage, get sales leads, and grow business - gets attention. But you've got to be quick and you've got to be on pitch. 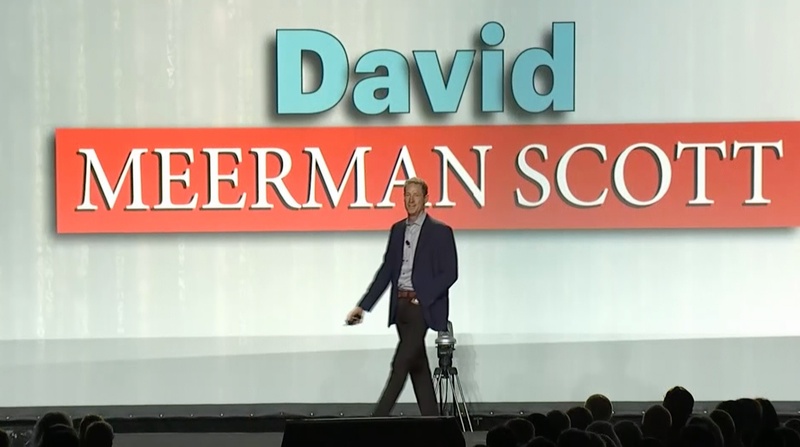 Newsjacking to Generate Media Attention and Grow Business Now from David Meerman Scott on Vimeo. In my talk, I teach the art and science of real-time content creation and how it leads reporters and editors to you and generates speaking inquiries. My concept of Newsjacking is now so popular that it was shortlisted by Oxford Dictionary as word of the year for 2017. I was proud that the audience honored me with a standing ovation at the end. That’s a reflection on the power of newsjacking to build business.